I heard you well before you caught sight of me. Stubbá lies like a bridge between the enormous nature reserve Sjávnja and Muddus/Muttos National Park. Here we find an archipelago of forest islands, virgin forest, low fells and pine moors interspersing a vast wetland. 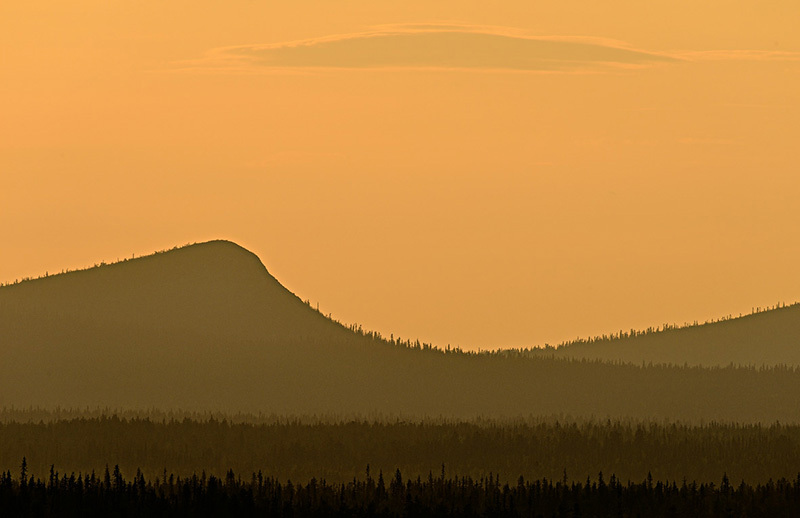 On the mountainsides there is coniferous forest, and higher up around the summits, swathes of mountain birch forest. 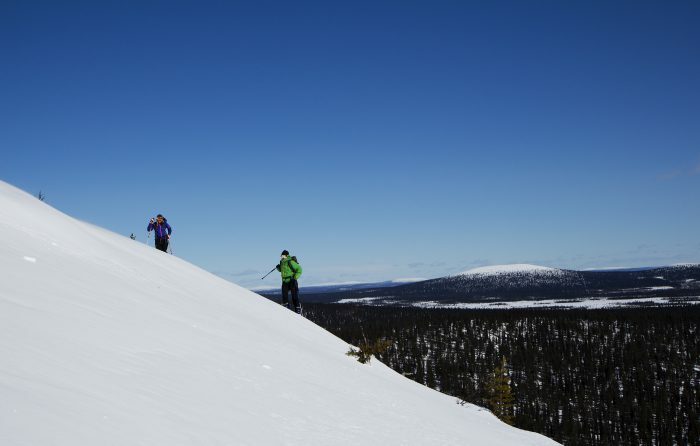 The old-growth forest in Stubbá is good stopover forage for the reindeer of Unna Tjerusj Sámi community, since there is plenty of the sought-after hanging lichen. The snow covering in April is often thick and will carry the weight of a reindeer. The hanging lichen on the branches is then accessible to the animals. The occurrence of hanging lichen is important during this period, since the reindeer cannot get at the ground lichen. Since the E45 road between Porjus and Gällivare cuts through Stubbá it is a good area for short day tours. Ski up on the mountain Gasska Stubbá or go out early in the morning for some birdwatching. 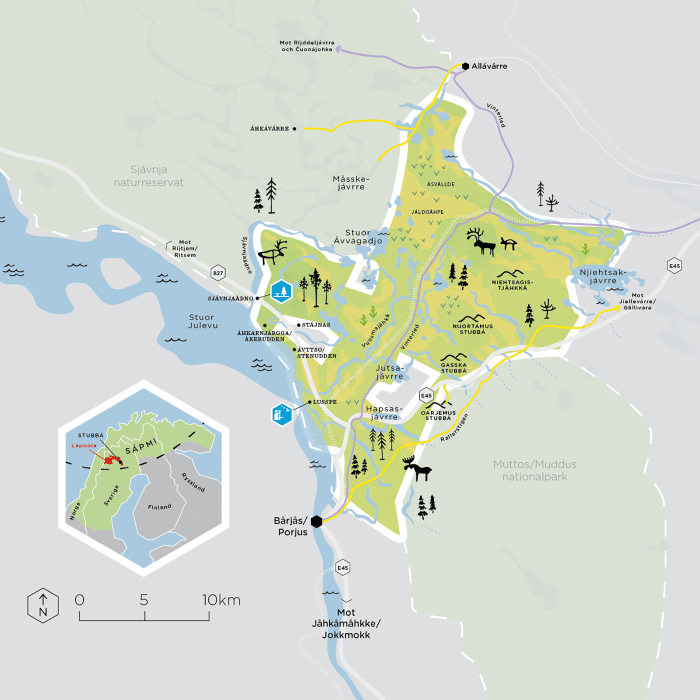 There are not many parts of Laponia World Heritage Site that are as accessible as Stubbá. Remember to wear a sturdy pair of boots, and do not forget your binoculars. A pleasant little winter day-tour in the middle of Laponia. Ski up onto Oarjemus Stubbá and look out over the forested and marshy expanses. The bilberry is one of the most common plants in Sweden and covers roughly 17 per cent of the country’s surface. 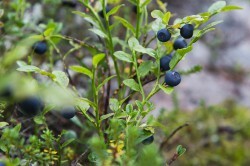 The bilberry has many beneficial properties. For example, unsweetened bilberries are a remedy for diarrhoea. In the Sámi language, wetlands have different names depending on whether they are large or small, wet or dry, in the mountains or the forest. Áhpe is a really big, wet marsh in forestland. Jiegge is a small marsh. Suotnju in North Sámi is a big wet marsh in the mountains where there may occur palsas (thermokarst mounds) and water springs. By studying the movements of reindeer and seeing where they cross you can learn how to traverse wetlands and ice. When reindeer are choosing their route naturally they do not walk out onto marshes or lakes where there is weak ice – only during reindeer roundups or if they are being chased by predators. Hanging lichen grows in fairly old forests. Birds commonly use it when building nests. The Siberian Jay builds its nest of dried twigs and insulates it with hanging lichen. A large number of insects and mites thrive in forest where there is hanging lichen.